Many a time I make rash spur-of-the-moment purchases only to regret it later on (which makes Nordstrom a fabulous shopping destination, though with a big slice of guilt on my part). 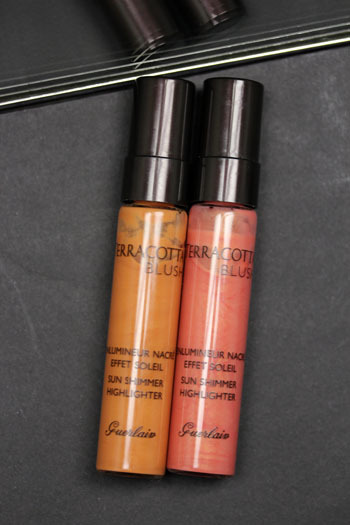 The Guerlain Sun Shimmer Highlighters in Sunny Pink 02 and Spicy Coral 03 were one such purchase, though without the regret – I performed one of my 30-second speed checkouts after seeing Karla Sugar's amazing swatches of them. After the initial frenzy calmed, I realized these things were ridiculously expensive for the size, and almost canceled my order. 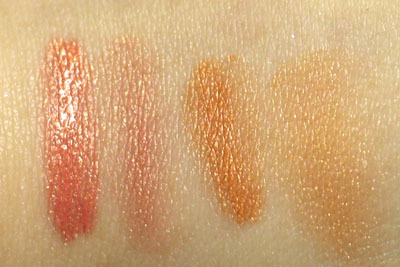 But I didn't have liquid blushes in my arsenal, so I was curious to see how they differed from powders and creams. As it turns out, not very much, except I get a really pleasant cooling sensation when I place them on my cheeks. 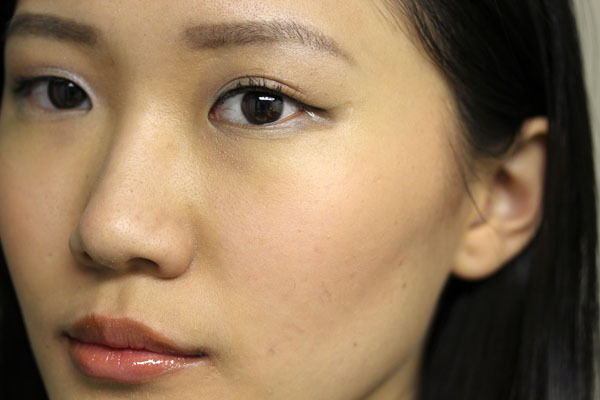 There's also the matter of learning how to blend liquid without sheering out the color too much, or not blending enough that they look like stripes on the cheeks. 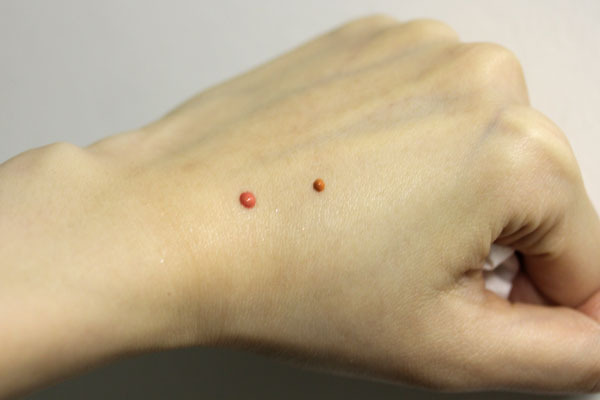 The good thing is I realized the unassuming size of the vials matters very little, considering that all you need is a tiny dot for your entire cheek (I made the swatches with just the amount shown above). Sunny Pink is a orange pink, while Spicy Coral is a gold orange. 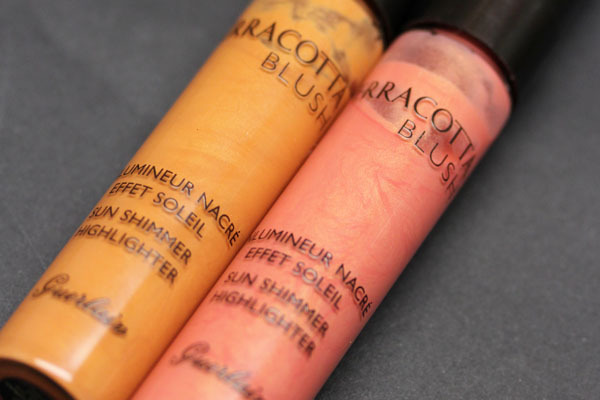 Both colors feature a huge amount of shimmer (which I guess is where the term "highlighter" came from), but not so much after applied to the cheeks. You can apply it pretty much any way you like. I use a flat foundation brush, while my friend Larie from Eye Heart It uses a stippling brush to cut down on the shimmer. You can use these alone or as a layering product. One of my favorite things to do recently is to layer 3-4 cheek products so that the color lasts throughout the day, which you can see in the looks from these two posts (here and here). I also found it to be a good traveling companion since I can just use my fingers to dab on the color when needed. Guerlain Sun Shimmer Highlighter in Sunny Pink 02 and Spicy Coral 03 retails for $41 and is available at Guerlain counters and Sephora. I love those! the pink one is my fav. they are very pigmented and I think they will last forever. shimmers and glitters are not for everyone and I can't use it everyday (work, etc) but I love them on a summery day. not a miss for me but sad to hear you are not liking them, always annoying to find out that something isn't working for one. I have both highlighters (you convinced me to get Spicy Coral, for which I'm so glad) and they do an amazing job of enhancing my face. In fact, I wore them in my last two FOTDs. Really perfect for summer! 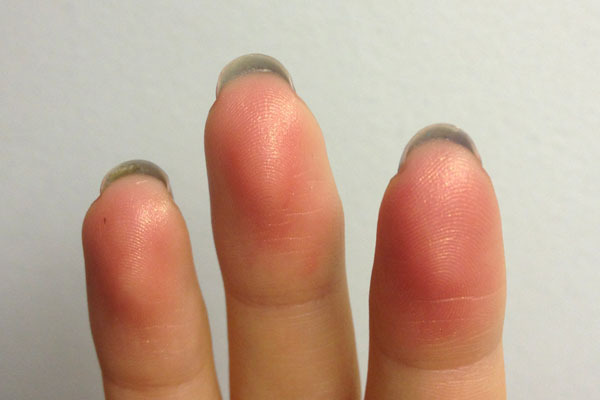 I find that I prefer liquid blushes to powder because I can't be bothered with a brush; I just use my fingers. By the way, I read somewhere that Guerlain intends Sunny Pink for blondes and Spicy Coral for brunettes. True or not? I just know that, as scary as it appears in the bottle, Spicy Coral does look more natural on me than Sunny Pink. CLOSE UP OF THOSE CHISELED CHEEKZ!! GORGEOUS!! I tried them at Sephora (Singapore doesn't have the full collection... yet) and couldn't get them to stay properly on the back of my hand, so these I skipped! Glad it worked for you, my friend Jacq layered a powder blush on top of hers and worked wonders! ah yes, me too. love using liquids/creams as bases, then layering. effect is great.